I’m an irregular follower of yours. I’ve seen you on Iron Chef, caught your show on the radio and read some of your stuff here and there. You seem to me to be one of the more accessible and sensible of the food critics out there. My wife and I ate at Craftsteak last weekend and as much as I like Tom Colicchio on Top Chef and wanted our 400.00 dollar dinner to be the best we’ve ever had, it was terrible. The steaks were the Wagyu rib eye and the house specialty, skirt steak. I’m the first to admit that my experience with top line restaurants in woefully lacking so I though I’d ask your opinion. I’d think that a top flight restaurant named craftSTEAK would have, well, the absolute best steak around and would know how to cook it absolutely perfect in every way. Short version. We ordered medium rare meat and what arrived were two steaks that were so far past well done that the skirt steak was actually brittle, bone dry and so tough I’d have called it filet of cowboy boot if I didn’t know what it was. My wife tried three bites and couldn’t eat any more because, “it’s so tough and dry I just can’t try another bite. It hurts to chew.” The ribeye was a bit more tender but still brown from the center on out, no trace of pink anywhere and equally dry from over cooking. The rest of the meal was a high/low experience. The Yukon potatoes were very good and the jumbo prawns fresh and wonderful. The crispy sun chokes not so crispy, more like deep fried tofu and kind of tasteless. The service was terrific Victor and his staff were excellent. We both liked the decor and atmosphere. We left without commenting after leaving a 70.00 dollar tip (we feel the servers are not responsible for what the kitchen puts out in any restaurant, so we tip regardless). My question is, have you reviewed Craftsteak lately and if you did how do you feel about the place? Secondly should we let what might have been a bad night put us off the place? Any restaurant can have an off night, but one as vaunted as this one is held to a higher standard — a standard that doesn’t allow for two mishandled pieces of beef showing up at the same table. To your other question about how we feel about the place: we’ve always admired Matt Seeber (its executive chef) and the quality of the ingredients he brings in, but make no mistake, Craftsteak is a casino food factory pure and simple (and a celebrity chef food factory at that), serving hundreds of covers a night, so necessarily, there will be slip ups and let downs coming out of the kitchen. Bottom line: you should have complained to your waiter as soon as those first bites were taken, and the management should’ve offered to bring you two new steaks or take the shoe leather off the bill. Thanks for bringing your experience to our attention. 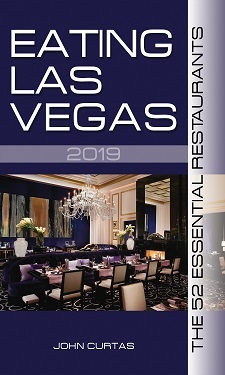 Because of it, our staff is planning an incognito visit to Craftsteak soon, to see if it merits inclusion in this year’s EATING LAS VEGAS – The Fifty Essential Restaurants. Two strikes and it will most certainly be out. I, too, have had disappointing meals at Craftsteak. Summing it up as a “high/low” experience is right on the money. One of our steaks was good, another bad. Some side dishes were fresh and delicious, others were overcooked, soggy and drowning in oil. For the prices being charged, I would think twice (or maybe three or four times) before returning to Crafsteak. By way of comparison, Cut steakhouse at the Palazzo (another celebrity chef casino food factory) was much tastier and more fairly priced. Surprising! Have been to both, Del Frisco’s was not only tastier but more affordable as well. Plus you don’t have to deal with the tourist masses & it’s convenient to the strip. I don’t have any need to defend the restaurant, but I wonder, if the service was great, wouldn’t that have included them asking if the steaks were cooked properly? Because that’s pretty standard in any good steakhouse I’ve ever visited anywhere, whether reviewing or not. It’s a shame that some customers don’t realize its not only their right, but in a way their responsibility to speak up if they’re not fully satisfied, whether in a fancy celeb-chef restaurant or at a fast food counter. I grew up on a large purebred Angus ranch. My father exported some female breeding stock to Japan in the early 80’s to supplement their Wagu program. I grew up on steak and eat if way too often for my health. I have tried every steak house in Vegas and while JC prefers Carnivino’s we have not had a good steak there in 3 tries. Craftsteak has been the spot that we love and when we have guests in town the spot we like to take them for steak. It disappoints me that you had a bad experience there. I took some customers there last Wednesday who were in town for Conexpo and our experience was first rate. We had the chefs tasting menu. 2 large porterhouse, 2 new yorks, a filet and a skirt and all were cooked perfect. All but one guest wanted medium rare with one liking medium. One of the new york’s was medium on one end and mr on the other. The sides, risotto, asparagus, spinach, potato’s were all very good along with the service and the wine. I would say that the next time something comes out not as you expect tell the wait staff they really there to take care of you needs. I too had a bad experience at Craftsteak. I must start by saying that it was a comped meal and I was only responsible for the tip ($75.00). Steaks were tasteless, and dry. The sides were OK, we had been told the Yukon Gold potatoes are fabulous by the waiter. I have made better at home. The wait staff was excellent, I wish the food as good. When I see that smug jerk on Top Chef, I want to ask him about his own place. Never been so glad to earn a comp as I was for this meal. If I had to pay for it I would have thrown a fit. Maybe that’s the problem. Thanks for publishing this John. I also had a bad steak there. I love their booze selection, but I went there with the wifey for a birthday and the steak was sent back TWICE. At the second time the manager should have dealt with it. The dogs loved the steak, incidentally; we did not. While I normally don’t make a fuss about things like this- if STEAK is in your name, you better stand by it fast. I think the charcuterie plate was the best part of the meal, but I have neither referred this restaurant nor have I returned. Look, once in a while you get a bad one, but we had 2 in a row. Our expectations were higher (considering the price), and I know a thing or two about steak. I don’t expect your column to be YELP related, as YELP basically is common denominator reviews that tend to be skewed. I also don’t expect your column to be as vitriolic as you seem to want it to be. However….. Some of these dudes need to be held accountable. I used to go to Simon’s for steak regularly and always had a good one- but with the economy as it is it is difficult to try to take a chance on a good meal based on expense, rather than taking a shot at odds on a good meal. Unfortunately nothing in life is guaranteed. If it’s not done right send it back. If it comes out again wrong, complain to the manager. If the manager gives you a hassle about an issue you are clearly correct about, get up and leave. If the establishment won’t stand behind their product (and this includes wine too) There are plenty of other places on the strip that would be glad to have your business. At these high prices, you should expect a perfect meal. Talk to the server if you do not receive what you expected. You’re the damn customer. If the staff doesn’t jump up and down to make it right, then you have an argument to make against the restaurant. I’ve eaten at Craftsteak a number of times, most recently last September when I was in town for the launch party of “Eating Las Vegas,” and staying at the MGM. I’ve always had good experiences at Craftsteak. They always graciously serve the full menu in the bar–an often more comfortable setting for the single diner rather than be stowed into a dark table in a back corner of the main dining room. A steakhouse is a steakhouse is a steakhouse, but the “best” steakhouses in Las Vegas do the sides, garnishes and desserts better than the competition that dwells below. CUT has a more creative and flavorful menu of appetizers than Craftsteak, (the gooey Bone Marrow Flan with Parsley Salad for example), but Chez Collichio does a particularly good job with roasted vegetables. The pan-roasted Hen of the Woods mushrooms are far better than the Creamed Spinach they dole out at other steakhouses. And can anyone resist the Parker House Rolls at Craftsteak? Puffy pillows of malty yeast served in little cast iron skillet with lots of butter. “I don’t have any need to defend the restaurant, but I wonder, if the service was great, wouldn’t that have included them asking if the steaks were cooked properly? Because that’s pretty standard in any good steakhouse I’ve ever visited anywhere, whether reviewing or not. Absolutely. The service staff should have asked about the quality of the steak and if it was prepared to the customer’s satisfaction. The customer in turn, in order to have their expectations met, also has an obligation to hold the staff accountable. That includes the service staff. Leaving a large tip to reward the service staff in turn sends a message to the eantire team of employees at the restaurant, (including the cooks in the kitchen), that the customer experience must have been good. Rewarding a poorly cooked beefsteak isn’t the way to hold people accountable. ELV responds: We see all sides of this issue: the harried restaurant, the disappointed customer, how the staff should’ve asked and the client should’ve spoken up….but the fact remains: a restaurant of this reputation, quality, and price shouldn’t be sending out inferior cooking to the public. Moreover, as much as professional eaters and serious restaurant amateurs like to ballyhoo what the customer SHOULD have said, the fact remains, many people who eat out are of a more reticent or shy nature, and aren’t comfortable confronting anyone about anything during their meal. Bottom line: Craftsteak, like almost any busy, 300 seat restaurant, seems to be a hit or miss proposition these days. And if it keeps disappointing people with the quality of its cooked beef, Colicchio’s reputation (fame?) will only carry it so far. If you don’t believe us, just ask Emeril. As the letter stated “The service was terrific Victor and his staff were excellent” so why are people assuming that the server didn’t check with the guest? If the server was considered “excellent” it seem as if the person who wrote this letter was just a little too shy to say anything to someone who could actually help fix the problem. If something isn’t served properly speak up and give the restaurant (or any other business for that matter) a chance to make things right. If they still don’t fix the situation THEN feel free to go home and launch your anonymous attacks on yelp, trip advisor, or a various blog. Play fair, fokes! If a steak comes out in that condition, it isn’t up to management to “offer” to take it back. It’s their responsibility. And no customer should ever feel timid about demanding a steak prepared exactly how it was ordered. In any good restaurant, if this happened, all you would need to say to your waiter is “Excuse me, we ordered our steaks medium rare, and these are obviously well done” and the waiter should automatically apologize profusely and bring out new steaks. (And in most cases they should try to make it up to you with a round of drinks, free dessert, or something.) If their immedialte response is not a swift apology and two new steaks, you should simply reply “Well I’m sorry, this is inedible. Please just take it off our bill and bring us our check.” Then go eat someplace else! The fact that people would suffer through a steak like that, and then pay for it demonstrates how far too many people are intimidated by fine dining restaurants. If you’re paying for your meal, you’re the boss! Case closed. While I agree that the customers should have spoken up about the quality of their steaks, I also think it is the server’s responsibility to look at the visual cues on a diner’s plate in a restaurant of that caliber. The server should have noticed the overdone steaks (because the order was placed with them and they knew how they should be cooked) and whisked them away immediately, and if they missed that (which would mean that they did not stop by the table promptly after the plates were dropped), they should have noticed that the customer was not eating it at all. In a restaurant where a waiter has only a few tables, and multiple servers, runners, bussers and captains visit a single table in a matter of minutes, it is inexcusable that such an error was missed by the staff. My husband and I ate at Craftsteak for the first time a little over a month ago and we also had a bad experience. The food was bland and far too expensive for what it was. We’ve eaten at Carnevino numerous times, Botero, and Cut among numerous other Vegas steakhouses and this was the most expensive and least appetizing meal we’ve had. We spoke to a woman sitting next to us who had also dined at many Vegas steakhouses before and she was also very disappointed in the food quality as value as the relative value of the meal. We also had by far our worst meal in Vegas at RM Seafood a few months earlier. Although I love watching Top Chef, based on these two experiences, I will definitely think twice before going to a restaurant ran by anyone that had anything to do with the show. I’m glad I had a chance to eat at Alex before it closed because now that Stratta is going to be on Top Chef Masters, his food quality will probably follow this sad trend and decline significantly. Maybe these celebrity chefs need to refocus on what made them celebrities in the first place and check up on the restaurants that bear their names more than twice a year. I’ve also eaten at Craftsteak and would never go back. Unlike the original writer, all of my food did come out prepared as ordered (and I’m with the others who would have said something if it did not). However, even cooked to the proper temperature, EVERYTHING was severely bland. There are far too many better steakhouses in Las Vegas to waste your time and money at Craftsteak. In fact, the funny thing is that I have a hard time with Tom Colicchio’s credibility as a judge on Top Chef because I know what kind of sub-par food they are serving at this restaurant of his!! Does anyone own a barbecue/grill? The greater majority of all steakhouses In Las Vegas, serve food that is simple enough for anyone to prepare on their own, and for a fraction of the price. Anyone with a Costco membership or two-feet has access to the same qualities of meats these places use (choice, prime, wagyu, wet or dry-aged). Let’s face it, it’s steak, no matter how it’s cooked, it’s steak… There is no secret technique or skill needed to cook it; just a broiler, pan & oven, or a grill. More thought goes into making a pizza or mac&cheese , than cooking a steak, but for some reason these places are thriving better than ever and more and more of them keep popping up around the valley. Maybe I’m the exception, but I choose to spend my money at places that have food prepared in a way that I can’t replicate successfully at home (Raku, Settebello, Los Antojos). However, amongst the number of steakhouses I have visited in town, I would have to say that one of my favorites and definitely the most memorable was The Golden Steer. The Steer’s atmosphere is a rarity within Vegas, and it’s like time traveling back in time to when the the Rat Pack and Bugsy were around. The food is also great and their prices are very reasonable.